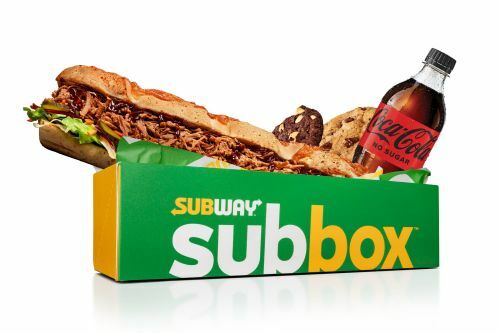 Menulog delivers for Subway - Kilsyth so you'll be able to track your courier on a map. s there a better combination? Tender chicken strips, topped with premium tasty bacon, melted cheese, then smothered with ranch dressing. What are you waiting for, order yours today! Let this lightly crumbed chicken Schnitzel bring some lunch or dinner deliciousness to your table. This sub is made from 100% chicken breast and loaded with flavour! Dig into this sub for a big hearty meal. Vegetarian or not, you will love our Veggie Patty sub. The perfect meatless option. Add Avo for an extra protein hit. All proteins including Chicken Teriyaki and Falafel are to be served cold. Serves 5-8 people. 5 Subway Footlong® Subs in total of 15 portions. 1 x Chicken Strips, 1 x Leg Ham, 1 x Carved Turkey, 1 x Italian B.M.T. 1 x Veggie Delite with Avo. Serves 5-8 people. 8 Subway Wraps® in total of 16 portions. 2 x Chicken Strips, 2 x Leg Ham, 2 x Carved Turkey, 2 x Roast Beef. Serves 5-8 people. 5 Subway Footlong® Subs in total of 15 portions. 2 x Smashed Falafel, 3 x Veggie Delite with Avo. Serves 5-8 people. 8 Subway Wraps® in total of 16 portions. 4 x Smashed Falafel, 4 x Veggie Delite with Avo. Serves 5-8 people. 5 Subway Footlong® Subs in total of 15 portions. 1 x Sweet Onion Chicken Teriyaki, 1 x Chicken Strips with Pesto Mayo, 1 x Italian B.M.T. with Ranch Dressing, 1 x Carved Turkey with Cranberry Relish, 1 x Leg Ham with Seeded Mustard. Serves 5-8 people. 8 Subway Wraps® in total of 16 portions. 2 x Sweet Onion Chicken Teriyaki, 2 x Chicken Strips with Pesto Mayo, 2 x Italian B.M.T. with Ranch Dressing, 2 x Carved Turkey with Cranberry Relish. Serves 5-8 people. 8 Subway Wraps® in total of 16 portions. 2 x Sweet Onion Chicken Teriyaki, 2 x Chicken Strips with Pesto Mayo, 2 x Italian B.M.T. with Ranch Dressing, 2 x Carved Turkey with Cranberry Relish. Gluten-free wraps must still be heated prior to assembly. Recommend building Gluten Free Wrap Platter 30 minutes before pick up time.